Although I know Lafayette is the center of Cajun food, music and culture, this is certainly not the only type of food worth exploring in the area. I had read many good reviews of the Asian restaurants in the city, and Blu Basil seemed to be at the top of the list. Blu Basil is a Vietnamese restaurant that also serves “Asian Fusion” (according to Yelp). My take on it is that it is Vietnamese food plus other items, rather than the Vietnamese food being Americanized into a fusion cuisine. The atmosphere is quite elegant, giving the customers the feeling that they are at a “special treat” Asian restaurant, yet the prices are moderate (they are higher than I would want to spend every day but are far lower than I have seen for special occasion type Asian restaurants in various cities). 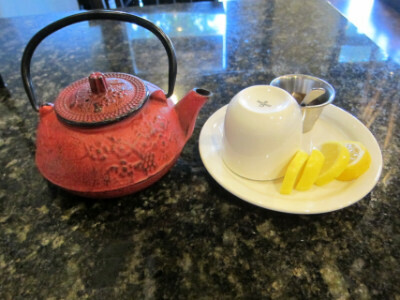 Some on-line reviews indicated that Blu Basil had one of the most extensive Asian food menus in the city, and this is one of the things that initially drew me to the restaurant. When talking to the waitress, though, I found out that some of the more interesting Vietnamese dishes had recently been dropped from the menu due to low demand by customers (one of these was the Banh Xeo). Although I was disheartened by this (thinking that every city deserves a good Banh Xeo), there are other reasons Blu Basil is still a good choice. I experienced quite heavy traffic throughout the city as I made a tour, aggravated largely by major construction zones as well as what appeared to be major population growth around a street system which had been designed for a much smaller city. 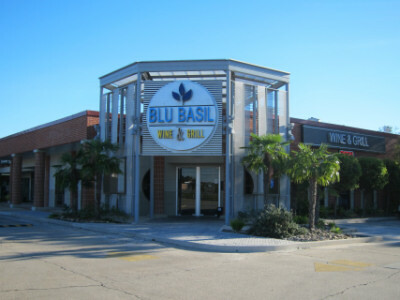 Although it is good that some of these problems are now being resolved, I was made more aware of the fact that Blu Basil offers a tranquil haven of good food, soothing jazz music, and friendly employees. The nicely decorated interior made me think I was going to have to pay quite a bit for my meal, but it turned out to be pretty reasonable (I was too late for the lunch specials which are served until 3:00 P.M but dinner is not much more expensive). One of my favorite dishes at Vietnamese restaurants is the vermicelli bowl, and Blu Basil had several from which to choose. The Grilled Chicken Bowl actually had the extra bonus of coming with spring rolls, and although this almost made this dish too much for my appetite, I certainly thought it was enjoyable. The good points of the dish included high quality meat, a good mixture of vegetables, a good fish sauce, and of course the very good spring rolls. The negatives included the fact that they did not offer lemongrass chicken and the fact that the dish did not include mint among the mixed vegetables. Neither of these detracted greatly from the dish, although if I lived in the area I would hope these would be available in the Vietnamese food. For hot tea the restaurant serves a very high quality jasmine tea served with loose leaves. I was somewhat amused by the lemon and honey they give you to put in the tea, but it was quite good without these additions (but at least everyone has a choice). In addition to the jasmine tea I ordered they also offer green and chrysanthemum hot tea, Vietnamese iced coffee, iced tea, orange juice, and freshly squeezed lemonade. All of these items currently cost $3.50 and at least with respect to the jasmine tea, I thought it was well worth it. In a sense I felt that the food here was really better than in other Vietnamese restaurants to which I have given the same rating, but it is taking into consideration the fact that Blu Basil does not have as large a choice as other restaurants (such as the fact that no lemongrass chicken is available). 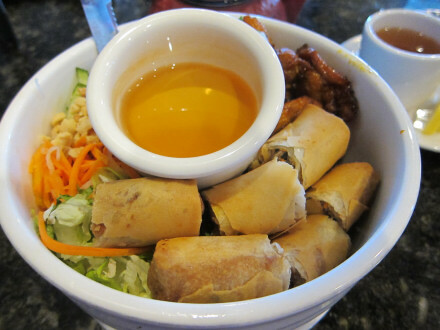 I will say, though, that adding the spring rolls on top was an unexpected bonus that few other restaurants include. The menu included quite a few dishes that either looked like more exotic Vietnamese dishes or were “fusion,” so I think if you come here expecting to pay $$$ instead of $$ you might well find some very good dishes. They have a large variety of pho, and it seems as if they have the basic dishes well covered as well as the more expensive and elaborate ones. This entry was posted in Lafayette, LA by Steve. Bookmark the permalink. © Steve's Food Blog, 2015-2019. All rights reserved.